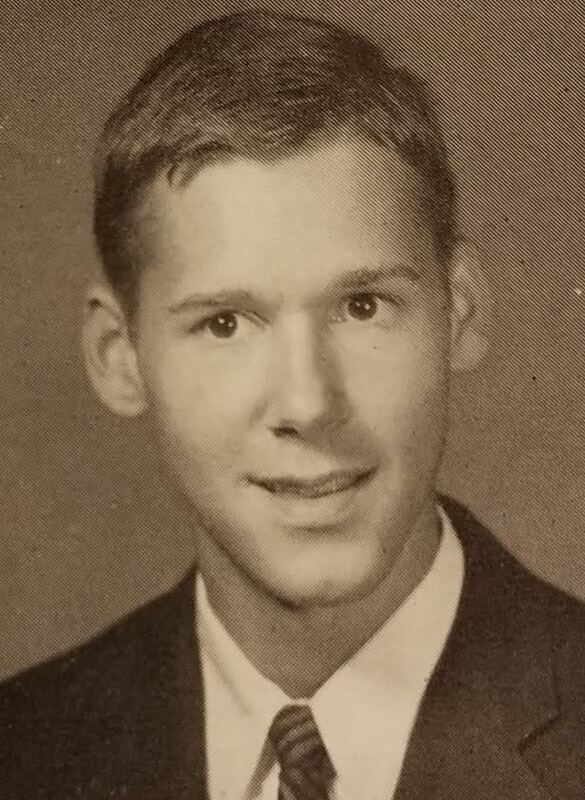 On May 9, 1962, sophomore Jim Dinsmore penned a column, “Cluttered Heart Cries for Expression on Issues,” in The Auburn Plainsman. The column wandered over a variety of topics. One paragraph would ignite a firestorm. That was it. A single paragraph on integration that turned out to be accurate in its forecast. But meetings and statements and letters later, Dinsmore would step aside from the newspaper staff for a year. He would be disqualified from running for editor, probably because of that column. And The Plainsman would be suspended from summer publication for the only time in its history, perhaps because of that column. Paired with the fear-inducing mention of integration, it had the Publications Board running scared — of the Board of Trustees, and even the Alabama Legislature. Professor Paul Burnett, who taught journalism classes within the English Department, “reminded the Board that the Trustees considered last spring the discontinuance of the newspaper” (after a pro-integration column by editor Jim Bullington), according to meeting minutes. Burnett was afraid that the Trustees would suspend Plainsman publication for the next academic year if the Board did not take action. He was not overstating the hazard. 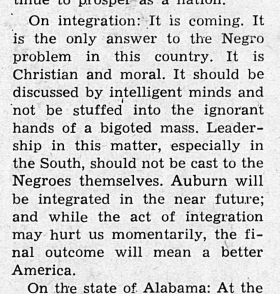 The year before, after Bullington’s pro-integration column, the board had stipulated that before any article “having a bearing on the good name of Auburn University” was published, the editor would advise Dean Foy. Draughon took the board’s action to mean that Foy could direct The Plainsman editor not to run such an article, and the editor would have to comply. In other words, the board and Draughon said Foy was empowered to censor The Plainsman. In addition, Draughon warned, “If further instances should occur, The Plainsman would have to be discontinued,” Foy wrote to Bullington in a letter that is included in the archives with the Publications Board minutes. So Burnett’s fears were strongly founded. The Board voted to reprimand Dinsmore for writing the article and Bullington for allowing its publication. They did not suspend Dinsmore from the newspaper staff, however, because they didn’t have to. During the debate, incoming Plainsman editor Charles McCay “stated that he hoped he would not have to bring this up, but first of all Jim Dinsmore and he thought that it would be to the best interest of everyone concerned if he would not write for The Plainsman next year,” the minutes noted. So The Plainsman editor half-suspended Dinsmore, and Dinsmore half-suspended himself. But in fact he did not write for The Plainsman that next academic year. At its meeting the week before, the day the Dinsmore article came out, the Publications Board had noted that no qualified editor candidates had stepped forward to edit the summer edition. Two candidates had applied, but the board considered them unqualified, whether by lack of experience or lack of coursework. So the board voted not to publish The Plainsman for summer quarter 1962. No provision was made to wait and seek a more qualified candidate. Did the Dinsmore column firestorm cause the Board to seek a cooling down, Plainsman-free summer quarter, with the candidate situation providing a convenient excuse? The minutes don’t say; still, this is the only time that happened. The Plainsman has produced a smaller issue, in print or later online, every summer since. This drama had its epilogue in spring quarter 1963. Dinsmore tried to run for editor, but his application was disqualified because it had arrived a day late. In a letter to the editor that ran in the March 27, 1963 edition (whether by Foy’s permission or not is uncertain), Dinsmore explained that he had spent spring break at home for minor surgery. His mother had mailed the application before the deadline, but it had arrived after. Dinsmore acknowledged his procrastination in the letter (an eternal theme with college students). But he noted that late applications had been accepted in the past and he argued that he had “submitted” the application before the deadline, as stated in Publications Board policies. His mistake, of course, was giving the Publications Board a quick and easy excuse to reject his application without having to address the column of the year before. Dinsmore would go on to make one more statement about integration. At the beginning of winter quarter 1964, the day Harold Franklin was allowed to register, students were warned to leave him alone as he walked from his dorm room to the library. But two members of The Auburn Plainsman staff approached him as he left the library and welcomed him to Auburn. They were detained and questioned by police and released. One was Bobby Boettcher, yet another pro-integration columnist. The other was Jim Dinsmore.